Presented at the National Autism Association conference. Gastrointestinal disease and immune dysregulation. If you scan through the list, you'll see that there's nothing in there about autism. I am an emergency medicine-trained physician--very mainstream, very traditional. In 1998 I finished residency and started my career, happy to become a very anonymous ER doctor who completed his shift and went home to spend time with his family. For a long time, everything went as planned. In 1998 my second son Aaron was born. You can see in his toddler pictures that he was very well connected, very happy, and he had great eye contact. He was a normally-developing kid. We had no reason to suspect that there was anything wrong with him. In fact, my older son had more of the characteristics we associate with autism. He was very colicky and very sensitive to sound and light when he was a baby. So, Aaron was a real pleasure. In a picture of Aaron after his third birthday, you can see that he was a different child. He no longer had any eye contact, he was pale, he did not appear happy or healthy, and he was no longer connected. Although we were concerned about him, we didn’t suspect autism. Our pediatrician told us not to worry. It wasn’t until my wife, Laurie, started looking on the internet that she connected the dots and diagnosed him with autism herself. It took me longer to accept this. I had a lot of excuses for why he wasn't talking; his older brother was talking for him, he was just stubborn, he was independent. This actually delayed the official diagnosis. He certainly didn't fit my picture of autism, which basically came straight from "Rainman." They barely mention autism in medical school. But after reading the stories that Laurie found from other people, I had to admit that they described our little boy. Even though we knew he was autistic before we brought him in for an official diagnosis, we weren't remotely prepared for what the psychiatrist told us. He said, "Your son meets ten out of the twelve criteria for full-blown autism. His prognosis is very poor. He's likely to be institutionalized. You can put him in our school and we'll try to teach him some skills, but it's unlikely that he's ever going to achieve any kind of functional level." Furthermore, he said, "Don't waste your time looking at alternative treatments like diet and vitamins and things like that because they’re a waste of money." Since I was a very traditional allopathic physician, I didn't know that there was any other way of thinking about autism. I thought the only possible course was acceptance. I knew that the day would never come when we would put him in an institution, but I didn't realize that there was a lot more information about autism than what we were being told. Laurie was not willing to accept the prognosis and started researching on the internet. I'm sure this is a story that many of you are familiar with--she found the Autism Research Institute (ARI) website and she started Aaron on a glutenand casein-free diet and added B6 and other vitamins. She brought the information to me. I assented because I thought that she needed to feel like she was doing something and I knew it wouldn't hurt Aaron. But when she started bringing me research papers about the possible dangers of vaccines, I took notice. I said, "This is ridiculous. Vaccines have nothing to do with autism." And I started reading the research in order to prove her wrong and to show her that I knew how to read research and she didn’t. To make a long story short, here I am. I became involved because I was told my son would be institutionalized, and that was unacceptable. I also became involved because there seemed to be a lack of knowledge about autism among the medical community in my area. None of the supposed autism experts or the pediatricians we consulted could give us any answers. I became involved because what I was reading and seeing in the medical literature and in my own son and in other children was disproving or contradicting the mainstream dogma of autism. Backtracking a little, I’d like to look at the history of autism. I think the history of autism is like the parable of the three blind men and the elephant. You all know the parable I’m sure. The first blind man feels the trunk and says, “This is a snake.” The second blind man feels the elephant’s leg and says, “This is a tree.” The third blind man feels the elephant’s tail and says, “This is a rope.” They don’t realize that they’re feeling a much more complex organism. Autism is a lot like that. In the history of autism there have been a lot of blind men. The first blind man’s name was Bruno Bettelheim. I’m sure that most of you are aware of his “refrigerator mother” theory. He claimed that children became autistic because they withdrew in response to their cold, unloving mothers. Thanks to Bernard Rimland and other people this theory was discredited, but it was the mainstream theory for decades. As recently as 1981 Bettelheim said, “All my life, I have been working with children whose lives were destroyed because their mothers hated them.” This is what some of the experts believed about autism even very recently. Other blind men said that “Autism is a developmental disorder with impairments in language and social interaction and associated with repetitive, stereotyped behaviors.” I’m sure you’re familiar with this; it is the current definition of autism in the DSM IV (Diagnostic and Statistical Manual of Mental Disorders). Well yes, it’s true. Autistic children have developmental problems, but this is only one part of the organism that we call autism and if you stop there, you’re missing the boat. Other blind men say that autism is a genetic illness. The implication is that nothing can be done because the events leading to the disease happen very early in fetal development. Autism is a genetic illness in that it has a genetic component, a genetic susceptibility, but if you stop there you’re also missing the boat. The blind men can’t answer these questions: if autism is a genetic illness, why is the incidence increasing so dramatically? If autism is a behavior disorder, why do the children have chronic bowel problems? Why do they have ear infections, frequent viral infections, and eczema? Why do they have nutritional deficiencies? And why do most autistic children seem to develop normally and then start to regress? These are questions that can’t be answered by their theories. This illness was first described back in 1940. In 1940 doctors may not have known as much about how to treat certain diseases, but they were very good at describing them. That’s when most of the illnesses that we now know about were first labeled. Autism was unheard of and unreported before then. When Leo Kanner described it, he said that neither he nor his colleagues had ever seen autistic children before. Full-blown autism is not a subtle disorder. Had it existed, it would have been described in the medical literature. It’s been more than sixty years since then. Where has the research been? We have very little still. The only explanation I have for that is that since it was considered to be a very rare genetic disease, the government didn’t feel research merited funding. Even now that we know that it’s not rare--the CDC acknowledges that more than 1 in 166 kids are on the spectrum--there’s still very little money going to autism research compared to other diseases with similar incidence rates. Here is a graph of the research dollars spent per patient in a variety of disorders. In the US the number of patients affected with AIDS and with autism are basically the same. For every AIDS patient about one thousand dollars are spent and for every autistic patient about forty dollars are spent. I think AIDS, diabetes, breast cancer, and MS are very important diseases, but if you look at the economics or the social cost to society, autism trumps them all. The cost of caring for all of our autistic children, and the cost of their lost productivity, far outweighs any of these other disorders. Why are the media and the government ignoring the problem? You hear President Bush on the news talking about avian flu or West Nile virus, and the possibility of an epidemic--well, we have an epidemic of autism under our very noses. Why is this not on the front page of every newspaper? Where is the research? Only recently has the medical community been paying attention to autism. It’s still too little and too late. If you remember one thing from my lecture, I hope it’s this: you can make a difference. Almost every significant advance that has ever happened for autism has ultimately been the result of the efforts of parents. This is not a disease that is going to be cured from the top down. It’s going to be cured from the bottom up. The NAA slogan for this conference is: “In order for us to hear their voices, we must first raise ours.” NAA’s mission is to bring awareness to this disease. Looking at the history of government spending on autism research, we can’t expect much unless we parents start making a difference. The reason awareness is increasing now is because of the efforts of all of you. We all have a part to play. We can’t just focus on our own children, we have to help everybody else’s children too. The reason we see California statistics so often is that they’ve been keeping track of autism diagnoses longer than any other state, since the 1970s. Most states started in the ‘90s when it was mandated by the Department of Education. The curve keeps going up. If you look at this number at the top, it’s 28,000. Back in the ‘70s, there were fewer than 100 cases in California. Now there are 28,000 cases. They’re adding more than 3,000 cases every year. There’s a theory that the reason that California has so much autism is because computer geeks and engineers with no social skills move to California and marry each other and have a lot of autistic kids. The proponents of this theory claim that California’s explosion in autism diagnoses is specific to California. California is right in the middle. This is an exponential graph. 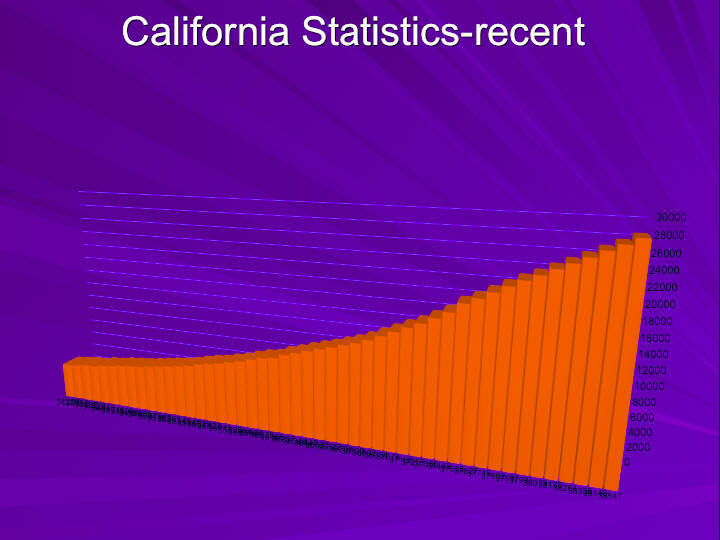 The national average is 714%, and California is average. Some of the states at the top went from virtually no cases of autism to thousands. This is a nationwide problem. And this is a problem of developed countries. We don’t know about underdeveloped countries because they don’t keep track. Is autism an epidemic? Autism experts say that the dramatic increase in numbers is due to several factors: broader diagnostic criteria, better diagnosis, or previous misclassification of the disease. Some say it’s because more parents are suddenly seeking services, giving misleading numbers. Let’s look at each of those arguments. Has the diagnostic criteria changed for autism? Yes, when the DSM IV came out in 1994 there was a change. They broadened the autism spectrum. They included diseases like Asperger’s, PDD-NOS, Rett’s, and CDD (childhood disintegrative disorder). They put them all under one umbrella. But they actually defined true autism more narrowly. If this argument was true, you would expect a spike in the rates for the first couple of years after the DSM IV came out, and then the rates would flatten out again. But that didn’t happen. The numbers continued to rise. California commissioned the MIND Institute at UC/Davis to study the epidemiology in order to see if they could explain the dramatic increase. They had several aims to their study. 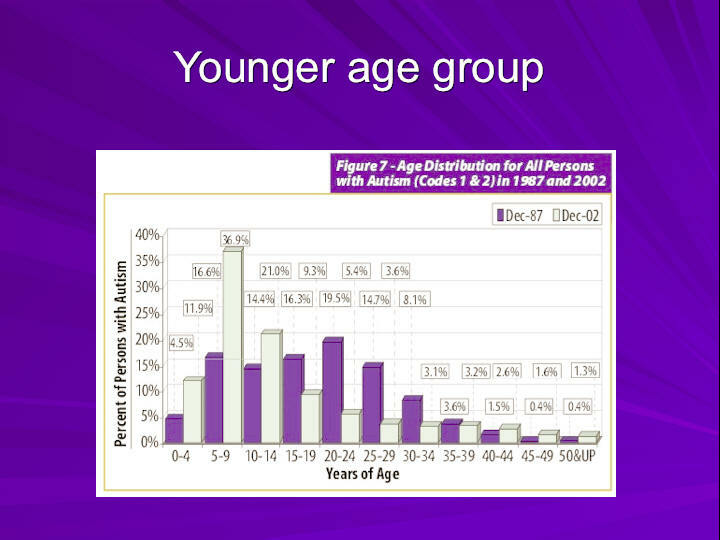 The first aim was to determine whether the different criteria used to diagnose autism explained the rise in the numbers. They looked at two groups, one born in the 1980s and one born in the 1990s. They went back and they re-diagnosed all of the kids based on the new criteria to see if there was any difference. They found that the change in diagnostic criteria could not account for the explosion. Most cases are still being referred through the education system or through the continued persistence of the parents. My experience has been that most physicians are still inadequately educated about autism, but I will say that awareness is improving. Unfortunately, most of the awareness has come because they’re so anxious to convince you that vaccines are completely safe, but I’m seeing many more kids getting an early diagnosis. You would expect earlier diagnosis from increased awareness, but it’s not going to change the total numbers in the community. 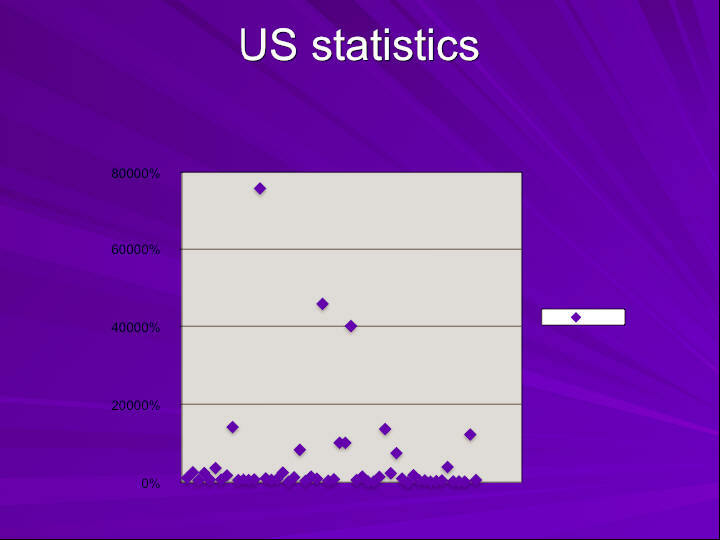 If you look at the purple bars, this is the distribution back in 1987. At that point from the age of 5 up until the age of 29 the bars were fairly flat, and then after that they dropped off dramatically. Look now in December 2002--the gray bars--look how the curve shifted to the left. Basically now a third of the patients in California are between five and nine years old. Eighty percent are younger than fourteen. All of a sudden an explosion of autism skewed the percentages towards our younger kids. All of those bars should be equal, if there isn’t an epidemic. I think the silliest argument is that there is an apparent increase because more parents are seeking services. Autism represents a significant financial and emotional drain on everyone involved. Do they really think that 10 years ago parents were less likely to look for help for their autistic kids than they are today? Suddenly there were so many great services available that parents started coming out of the woodwork to get help? In the old days we didn’t go to the doctor, we didn’t go to the school, we just stayed in our house. This is ridiculous. It is unreasonable to assume that the parents of more than 3,000 children a year in California alone did not seek any services for level one autism in previous years. It’s nonsensical, yet you hear it all the time, and you read it in well-established, well-respected medical journals. We know that autism is an epidemic. Why does it matter? It matters because there’s no such thing as a genetic epidemic. Ask any geneticist and they’ll tell you that genes on their own can’t work that fast. If autism is an epidemic, it has to have an environmental component; there’s no other explanation. The fact that it’s an epidemic matters because it’s going to guide our research, it’s going to guide treatment, and it also implies that there is treatment. It implies that there’s prevention, and it implies that there’s a potential cure, so it makes all the difference in the world. We need to shift our thinking to a new paradigm of autism. It’s an illness that has a genetic susceptibility factor exacerbated by an environmental trigger or a series of environmental triggers. If you look at most of our medical illnesses, they fit this model. Most illnesses, including diabetes, MS, and all the other autoimmune and chronic illnesses that are on the rise, fit this model. Even heart disease and some of the things that we think of as genetic traits fit this model. I use the analogy of a gun and a bullet. If you have a gun and a bullet, you can keep them separate and you’re not going to cause much harm, but if you put them together, it will lead to trouble. Autism is a complex metabolic disorder involving multiple organ systems, primarily the toxicological, immunological, gastrointestinal, and neurological systems. These organ systems are probably the most poorly understood and the most complicated of any in our body, and they’re also the most tightly integrated. For instance, more than 70% of the immune system is housed in the gastrointestinal tract, so you can’t have a problem in one and not the other. All of the neurotransmitters (the chemicals in your brain) also exist in the gastrointestinal system, where they have separate roles. The GI system is one of the main barriers against neurotoxins. Everything is tightly connected. Doctors like to specialize. We become cardiologists or gastroenterologists, and then we don’t have to answer all of the questions. Unfortunately the body doesn’t work that way. You have to look at the body as a whole if you expect to make a difference when you’re treating autistic children. It explains a lot of what we think is happening in autism. Methyl is like the body’s currency. It’s shuffled back and forth to accomplish particular jobs and then it gets recycled. These jobs include protein synthesis and methylation of DNA and RNA. It turns genes on or off (making them active or inactive), helps to form neurotransmitters, and helps to form cell membranes. These are all fairly important tasks. It helps create energy and then it can get recycled to form this molecule called glutathione. Autistic children have blocks in several areas of this pathway. The end result is that they’re not making glutathione. If they’re not recycling it, they’re not sending out that methyl group to do what it needs to do. Even before we understood why, we noticed that a lot of kids improved when we gave them B6, methyl B12 injections, zinc, or magnesium. These are all co-factors in this pathway. When I talk about nutritional intervention or multivitamins or minerals, it’s not just because they seem like a good idea, but because they’re targeted therapeutic interventions, not unlike a pharmaceutical. Can low glutathione create problems with environmental toxicity? Most of the time ER doctors leave biochemistry to the internists, but glutathione is important in the emergency room because of Tylenol overdoses. Tylenol is a very safe molecule unless you take too much. It is metabolized in your body by glutathione. Our body renders the Tylenol metabolite nontoxic and then we excrete it. If you have taken too much Tylenol and it overcomes the store of glutathione in your body, you can no longer metabolize the Tylenol, it becomes toxic, kills your liver, and then you die. The treatment for a Tylenol overdose in the ER is to administer a precursor to glutathione called N Acetyl Cysteine. Tylenol is just one example, but if you are already low in glutathione it’s going to take a lot less of any toxin to cause trouble. This makes sense. It explains why our children are particularly vulnerable to environmental toxicity, even with toxins that are relatively safe for other people. so you can see it’s a very important molecule in our body. We think that many of the symptoms of autism may be related to problems caused by environmental toxins. We know autism has some sort of environmental component, and toxins can be neurologically damaging, so this is logical. Trying to correct the underlying metabolic abnormalities and using methods to remove environmental toxins can help our autistic children get better. The main question is this: what toxins are implicated in autism? Is it caused by a single environmental insult, or an accumulation of multiple insults? I, for one, do not believe that it’s a single molecule, because autism is simply too complex. There are a lot of people who believe that mercury is the cause of autism. I think that mercury plays a role, but I don’t think that the removal of thimerosal from vaccines will cause autism to go away completely. In fact, I know it won’t because I’ve seen kids who have not been exposed to thimerosal who are still autistic. I think the analogy of the straw that broke the camel’s back is the most appropriate. Our autistic children are genetically vulnerable to start with and then they are loaded with lots of “straw.” Look at how toxic our environment has become. There are 80,000 chemicals that have been introduced into the environment in the last twenty years (the same period as the autism epidemic) that have never been tested for neurological toxicity. If you’re a child who can’t detoxify, any of those chemicals might cause harm. The accumulation of multiple chemicals can act cumulatively or synergistically, one making the other more harmful. I think that that’s actually what we’re seeing in autistic children. Now, having said that, I want to talk about mercury. I want to make it clear that there’s a lot of evidence indicating that mercury is an important factor. The way that the thimerosal issue is being handled by the government in determining research priorities is not transparent. The only way that their behavior makes sense is if they’re hiding something, and if they’re hiding something I want to know what it is. If it turns out that autism is not related to mercury, we can move on, but if it is related, that information will help determine treatment for our children. It will help prevent other children from becoming autistic. I’m not interested in placing blame, I simply want the kids to get better. In 1998 the FDA finally noticed that our kids were getting too much mercury in their vaccines. They realized that when the CDC added hepatitis B and HiB to the vaccine schedule in the early ‘90s, children were suddenly getting as much as two and a half times more mercury than they had before. This was in the first six months of life, which is the most critical time of development. On a single day if a child was given four or five vaccines, they would have received over 100 times the safe standard of organic mercury based on oral ingestion guidelines for adults. The FDA encouraged the manufacturers to stop making mercury-containing vaccines. They didn’t do a recall. A letter has recently surfaced in which GlaxoSmithKline offered to provide mercury-free vaccines immediately, but the government declined their offer. Apparently they were perfectly comfortable waiting a couple of years for all of the manufacturers to start producing mercury-free vaccines, so mercury-containing vaccines stayed on the shelves for years afterwards, at least until 2003 and probably beyond that. Thimerosal is nearly 50% ethyl mercury. Ethyl mercury is organic mercury, but it’s different from methyl mercury. It’s used as a preservative to enable the manufacturer to package their vaccines in multi-dose vials. It was known to be toxic by the manufacturer, Eli Lilly, when it was first developed. The original safety studies were very poorly done. They tested thimerosal in 1930 on 22 individuals, all of whom were sick with meningitis. They all died. Lilly concluded that it was meningitis that killed them, and that thimerosal was safe. That’s the safety study. That’s the “science” that grandfathered it in for use in our medical products. The LA Times reprinted memos from the 1990s that show that Merck knew that mercury levels in the vaccine schedule had become excessive, but they chose to do nothing. Thimerosal was removed from animal vaccines in the early 1990s because the veterinarians decided it was too toxic. A bottle of thimerosal is legally required to include a skull and crossbones on the label. It seems unfathomable that anyone would take a substance requird to carry this label and add it to baby vaccines. The CDC decided to investigate a possible connection between thimerosal exposure and autism. Surprise--they decided there was no connection. They were careful to consider only epidemiological studies, specifically ones which had been constructed to show no connection. 6,7, There was a lot of media coverage and all of the pediatricians were relieved. But SafeMinds looked at the data in detail and showed that all of the studies were invalid because of inherent biases and data misinterpretation.8,9,10 Some other epidemiology studies were done by the Geiers and they found that thimerosal was related to the increase in autism.11,12,13 The chance of developing autism went up by as much as 21% in one of their studies. There’s a lot more information on this controversy in David Kirby’s book, Evidence of Harm, and there’s also a lot of information at www.nomercury.org, www.safeminds.org, and www.nationalautismassociation.org. Because epidemiological studies can be manipulated so easily, they are not ordinarily used to prove causation or lack thereof. It is accepted within the scientific community that they are meaningful primarily to indicate areas for further investigation. They are not conclusive on their own. Is there biological plausibility? Is thimerosal neurotoxic? Parran14, Mutkus15, and Baskin16 have published three different research studies proving that thimerosal causes death in brain cells. Mady Hornig at Columbia University did a study on mice.17 She injected several groups of mice with thimerosal approximating the exposure our infants would have received on the CDC’s recommended vaccine schedule. Some of the mice were genetically predisposed to autoimmune disorders. What she found was that most of the mice were fine, but in the group of mice who were predisposed to autoimmune disorders, thimerosal caused social withdrawal and repetitive activity. She found brain damage very similar to what we see in the brains of individuals with autism. Thomas Burbacher did an extremely important study on infant monkeys.18 His study compared oral ingestion of methyl mercury with ethyl mercury injected into the muscle. He gave one group oral methyl mercury, simulating fish consumption, and injected the other group with thimerosal, simulating a vaccine exposure. He found that ethyl mercury left the blood stream very rapidly. That was very reassuring to most people, because methyl mercury takes 20-30 days to leave the blood stream. The CDC sent out a big press release saying that ethyl mercury was much safer than methyl mercury because it left the blood stream after seven days. The part of the study that they didn’t mention was the part that showed what happened to ethyl mercury once it left the blood stream. It crossed the blood-brain barrier, was converted into inorganic mercury, and became lodged in the brain. The half-life of inorganic mercury in the brain is 20 + years. That part wasn’t publicized, but it’s right there in the study--you can read it. An important conclusion Burbacher reached was that the safety of ethyl mercury could not be determined by methyl mercury studies. He called for further study of ethyl mercury to assess true toxicity. Currently all of the government safety standards are based on methyl mercury. Drs. Waly and Deth showed that thimerosal can interrupt methylation by interfering with methionine synthase.21 This is one of the enzymes that is in the methylation cycle. 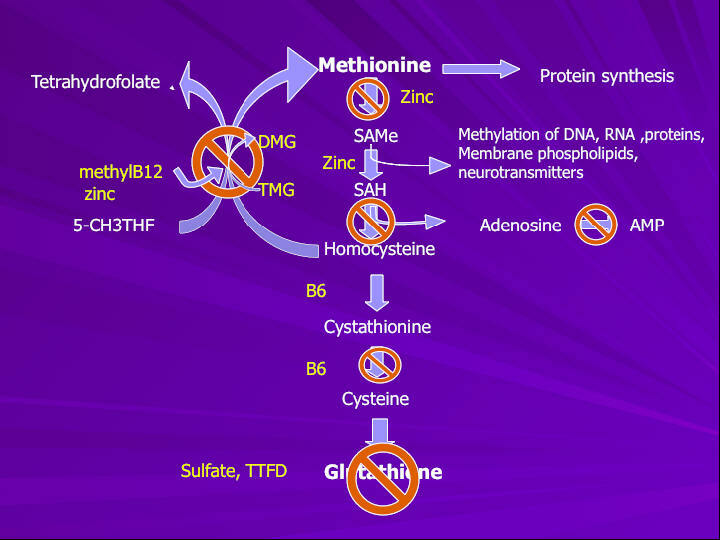 Methyl B12 is effective because it helps repair the disruption in methionine synthase. Thimerosal might be why our kids are having trouble with the methylation cycle. Dr. Amy Holmes published a study in the Journal of Toxicology in 2003.22 She tested the baby hair of children who were later diagnosed with autism. Hair is a measure of excretion. She compared the hair with hair from neurotypical (“NT”--developmentally normal) controls. She showed that with a comparable mercury exposure, the autistic children had less mercury coming out in their hair. At that time we had very little understanding of the impairment in the detoxification system of affected children, so the results surprised her. She expected more mercury to come out, reasoning that if kids are mercury-toxic they should have a lot of mercury in their body. The fact that these kids have significantly less mercury coming out in their hair than NT children makes perfect sense to us now, because we suspect they’re storing it. They also found that the younger children seemed to improve from chelation much more dramatically during this time frame than did the older children. ARI asks parents to assess the effectiveness of various treatments. They have data from 23,000 parents of autistic children. 73% of the parents who responded felt that their children improved with chelation, 25% reported no change, and 2% got worse. Compare that to Ritalin: 29% reported improvement, 26% reported no change, and 44% said their children got worse. Yet most of your pediatricians are happy to prescribe Ritalin--and they’re critical of people who are doing chelation because they claim it’s dangerous. 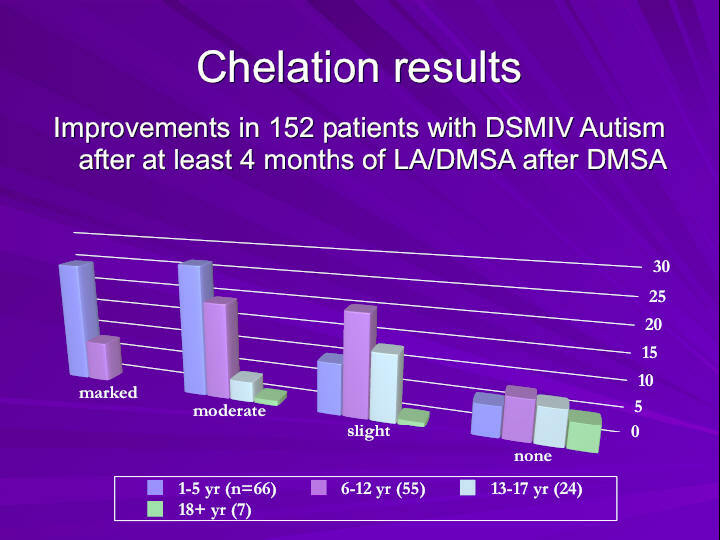 Jim Adams is currently doing a double-blind, placebo-controlled study of chelation effects on autistic children using DMSA. Based on what I’ve seen in my practice, I think this is going to be an important study and I think it’s going to see an effect. The CDC asked the IOM (Institute of Medicine) to investigate the autismthimerosal connection, so the IOM met and reviewed all of the literature, including the studies that I showed you. A couple of the studies weren’t out yet, including the Burbacher study. The IOM knew these studies were about to come out but decided not to wait. Their conclusion was that based on the epidemiological studies showing no relationship, no further studies should be done regarding thimerosal and autism. From a purely scientific point of view, does that make sense? We have a lot of biological evidence about mercury toxicity, we have evidence that it can cause autistic-like behavior, we have evidence that shows the damage it can cause in the brain cells, we have evidence that shows that autistic children have trouble with mercury in particular--but they announced that no further research was necessary in this area, and funding would not be forthcoming. I’ll let you draw your own conclusions. A recent study at the MIND Institute at UC Davis looked at the response of dendritic cells to a brief exposure of minute amounts of thimerosal.58 Dendritic cells act in the immune system as antigen presenting cells, which means that they take a foreign molecule, package it, and present it for the T-cells (killer cells) in the immune system to recognize and deal with appropriately. The study demonstrated that these cells are extremely sensitive to thimerosal-induced damage, leading to cell death at higher concentrations and cell dysfunction at lower concentrations of thimerosal exposure. Thimerosal also affected the secretion of cytokines, which are the chemical messengers of the immune system, resulting in an immediate exaggerated response followed by chronic immune suppression. It was also clearly shown that it was the ethylmercury component of thimerosal that caused the damage. The results of this study are potentially important to further our understanding of the role of thimerosal in causing or contributing to the immune abnormalities seen in autistic children. The implication is that thimerosal may have damaged their immune system and prevented them from responding normally to viruses and other toxins. Interestingly, dendritic cells are the site where measles virus is normally found in tissue biopsies. Undiagnosed abdominal issues are the cause of many of the behavior symptoms of autism. If you imagine yourself as a non-verbal or poorly communicative individual who has chronic or intermittent abdominal pain, a lot of your behaviors are going to look pretty autistic. One example is abnormal posturing. We see some children go to great lengths to put pressure on their lower abdomen. They’ll lie on the corner of a table or the arm of a sofa for hours. This was once considered an autistic behavior, but we now know that it’s done exclusively to ease pain. What we’ve learned is that when you treat the abdominal symptoms, a lot of what were considered autistic behaviors disappear. “Neuroglial Activation and Neuroinflammation in the Brain of Patients with Autism.” Diana Vargas documented that autistic individuals have inflammation in the brain. This was one of the first studies to show this, because the inflammation doesn’t show up on MRIs or CAT scans, but it does show up on biopsies of the brain (samples were taken from autistic individuals who had died.) The pattern of the inflammation is not consistent with the brain as the primary source. This is critical, because it suggests that the inflammation is starting somewhere else and the brain is a secondary target organ, not the primary source. If we can isolate the primary source, we have a target for treatment. Wakefield hypothesized just this--that the brain encephalopathy of autism may be secondary to an immune-mediated gastrointestinal abnormality, possibly mediated by opioid peptides and/or a chronic viral source. Autistic children have abnormal immune function including low natural killer cell function and a TH1/TH2 imbalance.36,37 This means that affected children are much more likely to develop allergies and antibodies and a lot less able to kill off infections. They have chronic inflammation and autoimmune reactions. Many of them have eczema, chronic runny noses, ear infections--they seem to be sick all the time. I also see kids on the other end of the spectrum who never get sick. Even though the rest of the family is sick, they’re fine. This suggests a hyper-immune state. These are the kids who are more likely to have auto-antibodies. The body attacks itself because the immune system is on hyper drive. Do the immune system and the gastrointestinal system interact? I mentioned before that 70% of the immune system is located in the gut, so if you have a leaky gut and an abnormal GI tract you’re going to have abnormal immune status.38,39 Exposure to common foods results in allergic reactions and creates chronic inflammation.40,41,42 Dietary interventions help--there are many studies supporting this.43,44,45, 46,47 With exclusionary diets, such as the gluten and casein-free diet or the specific carbohydrate diet, children improve as you eliminate some of the things against which they’re reacting. Jim Adams completed a study showing that many autistic children respond to multivitamin/multimineral therapy.48 You hear criticism of biomedical physicians who are treating autistic kids with vitamins. And yet mainstream medicine recognizes that some illnesses must be treated nutritionally. For example, alcoholism. Alcoholics have nutritional problems. In order to avoid brain encephalopathy, alcoholics need thiamine, folate, and multivitamins. Any doctor would be happy to prescribe these because they know that they make a difference. Another example is short bowel syndrome, in which the patient doesn’t have enough bowel to absorb nutrients. In any disease process that is inhibiting the body’s ability to absorb or utilize vitamins, supplementation is paramount. Vitamins are the co-factors for our energy. We need them for our metabolic system to work. And if you have a deficiency, it causes disease. How do the immune system and the neurological system interact? We already talked a little bit about this when we looked at the Vargas study49, but what about viruses? The immune cell patterns in children with autism are consistent with a viral mechanism.50 Does measles virus play a role?51,52 This is one of the biggest controversies in autism. All of the epidemiological studies seem to say no, but again they have significant design flaws. We continue to find vaccine-strain measles virus in the cerebrospinal fluid and in the enlarged lymph nodes in the bowels of autistic children and not in controls.53,54,55,56 MMR antibodies are associated with anti-brain autoimmune antibodies in autistic children.57 Does that mean that MMR is the cause of autism? We don’t know, but it is associated, and since measles virus is not present in NT kids, it merits further study. Here is an emerging model for autism: I call it the multiple-hit hypothesis. Imagine an embryo with genetically susceptible chromosomes that prevent it from detoxifying normally. The embryo will be exposed to things like mercury from maternal fish consumption and maternal amalgams, mercury from its mother’s flu vaccine and possibly her rhogam shot, antibiotics given to the mother, and other placental toxins that we don’t even know about. Babies need to be able to detoxify almost from conception. Children born between 1991 and 2003 were hit with 25 mcg of ethyl mercury in the hepatitis B shot the day they were born. Some are exposed to antibiotics soon after birth. Babies are exposed to toxins in breast milk. (I certainly don’t mean that you should stop breast-feeding because there are many more benefits than risks, but the reality is that it’s an exposure to toxins. I’m sure that there are toxins in formula as well). All of these exposures start to weaken the immune system of a susceptible child, creating early inflammation. They start to accumulate some of the toxins that they can’t get rid of. Remember that the immune system and the detoxification system really take six months before they start to become mature. As the child gets older, he or she receives many more immunizations. Food antigens are introduced, like casein from cow’s milk. They get repeated viral infections. They develop chronic ear infections and are given multiple courses of antibiotics. The antibiotics damage their gut even more, allowing more toxins to enter their system. So the child is developing a leaky gut, tissue damage is getting worse, the immune system is growing weaker, and autoimmune reactions are starting. Then a lot of kids experience a catastrophic event. Either in the form of a significant illness or a live virus vaccine. The immune system is overwhelmed and the child rapidly goes downhill. Plenty of parents report a gradual deterioration, but many kids seem to develop autism after a particular event. They go into the hospital or they get an MMR shot and they’re never the same again. But I don’t think that the illness or the shot is the only cause, I think autism is the end result of this developing series of reactions. The definition of “biomedical treatment” is medical treatment which addresses all of these issues. We look at the body from the biochemical perspective and attempt to treat the root cause rather than just patch a band aid on the symptoms. Psychotropic medications (Prozac, etc.) will not heal your children, they will only mask the symptoms of their poor health. Biomedical intervention is not alternative. We run tests to determine the source of dysfunction, and then we treat. I do not consider myself an alternative practitioner. I’m a mainstream, traditional doctor, and this is mainstream biochemistry--there is no such thing as alternative biochemistry. The research I’ve discussed today is simply cutting edge, and most doctors haven’t taken the time to look into it or to try to understand it. When we treat the kids we correct their nutritional abnormalities. We treat the gut. We support their own detoxification system. We remove the toxins from their bodies. We break the inflammatory cycle. We support their immune system. We treat for viruses. We try to heal the tissues. And we teach them. I mention teaching because I think there’s a misconception among a lot of people even within the autism community that either you seek biomedical treatment or you do ABA therapy. It’s not either/or, it’s both. You must remove the barriers medically, and simultaneously you have to teach the children. They have to be caught up to the stage their peers have achieved naturally. Education and medical treatment work hand in hand. This is the new paradigm in autism: autism is an environmental illness with a genetic component. It’s a complex metabolic disease, not just a developmental disability. It involves multiple body systems that are interacting with each other. Autism is treatable. That’s an important message to hear for those of you who are just starting out, but I think it’s equally important for those of you who’ve been struggling for years and years and still have a long way to go. It’s a marathon, it’s not a sprint. Autism is a very complicated illness. There’s still a lot we don’t know, but our understanding is improving. You’ll hear some parents say that their children virtually recovered after a single intervention. But for most of us, myself included, it’s a long process. It may take 100 interventions, it might take 10 or 15 years, and it will drain your resources and your emotions. But the important thing is to never give up. Our children are trapped in there and we have to fight to get them back out. The other important thing is that we must continue to fight for a cure. I said at the beginning of this talk that answers won’t come from the top down, but from the bottom up. Until we raise our voices loud enough to change the thinking of those in charge, we’re not going to make much progress. Until we have a government that is willing to look for the cause, we’re not going to have the answers. We all need to play a role. I believe that a cure is possible and I believe that autism can be prevented, but it’s going to take a lot of work from all of us. I’d like to briefly tell you about Thoughtful House. The part of my story I didn’t mention earlier is that after I started learning about autism I opened up a clinic called Children’s Biomedical Center of Utah. Ultimately I was intrigued by the idea of combining medical care, education, and research, and I accepted Dr. Wakefield’s invitation to join Thoughtful House. While we’re treating kids we’re also doing research studies for mainstream medical journals so that all of your pediatricians and family doctors will be more aware of what’s going on. In closing, I’d like to leave you with one thought. One of the many annoying things that my autistic son likes to do is to scribble on the wall. Most of the time it’s just a random scribble of color, but once there was a small rainbow down at the bottom of the wall. It reminds me that in spite of everything that we go through with our children, we have to remember to look for the rainbows. 2. Croen LA et al. The changing prevalence of autism in California. JADD 2002;32(3):207-215. 3. Blaxill MF et al. Commentary: Blaxill, Baskin, and Spitzer on Croen et al. 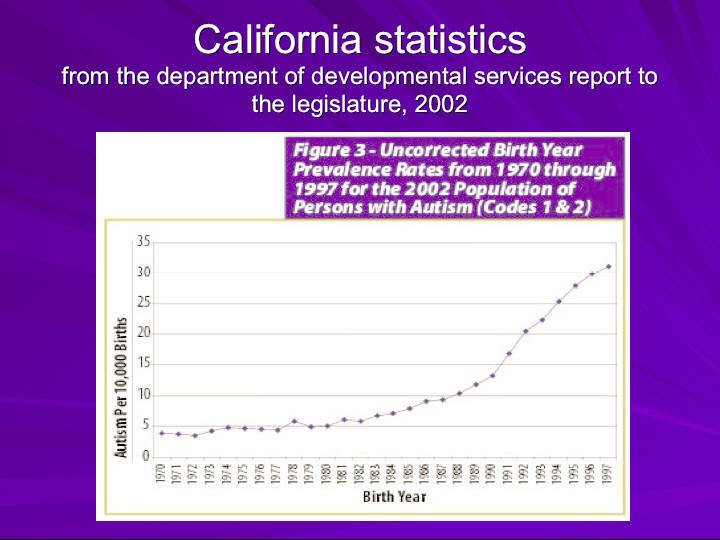 (2002), The changing prevalence of autism in California. JADD 2003;33(2):223-226. 4. James SJ, et al. Metabolic biomarkers of increased oxidative stress and impaired methylation capacity in children with autism. Am J Clin Nutr 2004;80:1611-7. 5. Bernard S et al. Autism: a novel form of mercury poisoning. Med Hypothesis 2001;56(4):462-471. 6. Verstraeten T et al. Safety of thimerosal-containing vaccines: a two-phased study of computerized health maintenance organization databases. Pediatrics 2003; 112(5):1039-1048. 7. Hviid, A, et al. Association between thimerosal-containing vaccine and autism. JAMA 2003; 290(13):1763-1766. 8. Danish Thimerosal-Autism Study in Pediatrics: Misleading and Uninformative on Autism-Mercury Link by Mark Blaxill, Director, Safe Minds report. 2003; www.safeminds.org. 9. Bernard, S. Analysis of the Danish autism registry data base in response to the Hviid et al Paper on Thimerosal in JAMA (October, 2003). Safe Minds report 2003; www.safeminds.org. 10. Safe Minds report. A Brief Review of Verstraeten’s “Generation Zero” VSD study results. 2003, www.safeminds.org. 11. Geier MR, Geier DA. Thimerosal in childhood vaccines, neurodevelepmental disorders, and heart disease in the United States. J Am Phys and Surg 2003;8(1): 6-11. 12. Geier MR, Geier DA. Neurodevelopmental disorders after thimerosalcontaining vaccines: a brief communication. Exp Biol Med 2003;228:660- 664. 13. Geier DA, Geier MR. A comparative evaluation of the effects of MMR immunization and mercury doses from thimerosal-containing childhood vaccines on the population prevalence of autism. Med Sci Monit 2004;10(3):P133-39. 14. Parran DK et al. Effects of thimerosal on NGF signal transduction and cell death in neuroblastoma cells. Tox Sci 2005. 15. Mutkus L et al. In vitro uptake of glutamate in GLAST- and GLT-1-transfected mutant DHO-K1 cells is inhibited by the ethylmercury-containing preservative thimerosal. Bio Trace Element Res. 2005;105:71. 16. Baskin et al. Thimerosal induces DNA breaks, caspase-3 activation, membrane damage, and cell death in cultured human neurons and fibroblasts. Toxicol Sci 2003;74:361-368. 17. Hornig M et al. Neurotoxic effects of postnatal thimerosal are mouse strain dependent. Mol Psych 2004:1-12. 18. Burbacher TM et al. Comparison of blood and brain mercury levels in infant monkeys exposed to methylmercury or vaccines containing thimerosal. Env Health Persp 2005; 113(8):1015-21. 19. Havarinasab S, Hultman P. Organic mercury compounds and autoimmunity. Autoimmunity Rev 2005;4:270-275. 20. James SJ et al. Thimerosal neurotoxicity is associated with glutathione depletion: protection with glutathione precursors. Neurotoxicol 2005;26:1-8.Mol Psych 2004; 1-13. 21. Waly M et al. Activation of methionine synthase by insulin-like growth factor-1 and dopamine: a target for neurodevelopmental toxins and thimerosal. 22. Holmes AS et al. Reduced levels of mercury in first baby haircuts of autistic children. Int J Tox 2003;22:277-285. 23. Bradstreet J et al. A case control study of mercury burden in children with autistic spectrum disorders. J Am Phys and Surg. 2003;8(3):76. 24. Afzal N et al. Constipation with acquired megarectum in children with autism. Pediatrics 2003;112(4):939-942. 25. Horvath K et al. Gastrointestinal abnormalities in children with autistic disorder. J Pediatr 1999;135:559-63. 26. D’Eufemia P et al. Abnormal intestinal permeability in children with autism. Acta Paediatr 1996;85:1076-9. 27. Torrente F et al. Focal-enhanced gastritis in regressive autism with features distinct from Crohn’s and Helicobacter Pylori gastritis. Am J Gastr 2004;doi:10.111;j.1572-0241.2004.04142.x: 598-605. 28. Wakefield AJ et al. Enterocolitis in children with developmental disorders. Am J Gastroenterol 2000;95(9):2285-2295. 29. Wakefield AJ et al. Ileal-lymphoid-nodular hyperplasia, non-specific colitis, and pervasive developmental disorder in children. Lancet 1998;351:637. 30. Wakefield AJ, et al. The significance of ileo-colonic lymphoid nodular hyperplasia in children with autistic spectrum disorder. Eur J Gastr Hepatol 2005;17:1-10. 31. Ashwood P et al. Intestinal lymphocyte populations in children with regressive autism: evidence for extensive mucosal immunopathology. J Clin Immunol 2003;23(6):504-517. 32. Furlano RI et al. Colonic CD8 and gamma-delta T-cell infiltration with epithelial damage in children with autism. J Pediatr 2001;138:366-72. 33. Ashwood P et al. Spontaneous mucosal lymphocyte cytokine profiles in children with autism and gastrointestinal symptoms: mucosal immune activation and reduced counter regulatory interleukin-10. J Clin Immunol 2004;24(6): 664-673. 34. Torrente F et al. Small intestinal enteropathy with epithelial IgG and complement deposition in children with regressive autism. Mol Psychiatry 2002;7:375-82. 35. Wakefield AJ et al. Review article: the concept of entero-colonic encephalopathy, autism and opioid receptor ligands. Aliment Pharmacol Ther 2002:16:663-674. 36. Jyonouchi H et al. Proinflammatory and regulatory cytokine production associated with innate and adaptive immune responses in children with autism spectrum disorders and developmental regression. J Neuroimmunol 2001;120:170-179. 37. Krause I, et al. Brief Report: Immune factors in autism: a critical review. JADD 2002;32(4): 337-345. 38. Jyonouchi H et al. Dysregulated innate immune responses in young children with autism spectrum disorders: their relationship to gastrointestinal symptoms and dietary intervention. Neuropsychobiology 2005;51:77-85. 39. Jyonouchi H et al. Innate immunity associated with inflammatory responses and cytokine production against common dietary proteins in patients with autism spectrum disorder. Neuropsychobiology 2002;46:76-84. 40. Jyonouchi H et al. Evaluation of an association between gastrointestinal symptoms and cytokine production against common dietary proteins in children with autism spectrum disorders. J Pediatr 2005;146:605-610. 41. Lucarelli S, et al. Food allergy and infantile autism. Panminerva Med 1995;37:137-41. 42. Vojdani A et al. Immune response to dietary proteins, gliadin and cerebellar peptides in children with autism. Nutr Nueruosci 2004;7(3):151-161. 43. Reichelt KL et al. Probable etiology and possible treatment of childhood autism. Brain Dysfunc 1991;4:308-319. 44. Reichelt KL, Knivsberg AM. Can the pathophysiology of autism be explained by the nature of the discovered urine peptides? Nutr Neurosci 2003;6(1):19- 28. 45. Knivsberg AM et al. A randomized, conrolled study of dietary intervention in autistic syndromes. Nutr Neurosci 2002;5(4):251-261. 46. Knivsberg AM, et al. Autistic syndromes and diet: a follow-up study. Sc J Ed Res 1995;39(3): 223-236. 47. Knivsberg AM et al. Reports on dietary intervention in autistic disorders. Nutr Neurosci 2000;4:25-27. 48. Adams JB, Holloway C. Pilot study of a moderate dose multivitamin/mineral supplement for children with autistic spectrum disorder. JACM 2004;10(6): 1033-1039. 49. Vargas, DL et al. Neuroglial activation and neuroinflammation in the brain of patients with autism. Ann Neurol 2005;57:1-15. 50. Uhlmann V et al. Potential viral pathogenic mechanism for new variant inflammatory bowel disease. J Clin Pathol: Mol Pathol 2002;55:0-6. 51. Stott C et al. MMR and autism in perspective: the Denmark story. J Am Phys Surg 2004;9(3):89-91. 52. Kawahima H et al. Detection and sequencing of measles virus from peripheral mononuclear cells from patients with inflammatory bowel disease and autism. Dig Dis Sci 2000;45(4):723-29. 53. Singh VK, et al. Abnormal measles-mumps-rubella antibodies and CNS autoimmunity in children with autism. J Biomed Sci 2002;9:359-364. 54. Bradstreet JJ et al. Detection of measles virus genomic RNA in cerebrospinal fluid of three children with regressive autism: a report of three cases. J Am Phys Surg 2004;9(2):38-45. 55. Bradstreet JJ et al. Detection of measles virus genomic RNA in cerebrospinal fluid of three children with regressive autism: a report of three cases. J Am Phys Surg 2004;9(2):38-45. 56. Ashwood P et al. Detection of measles virus antigen in children with autistic enterocolitis. In press. 57. Singh VK, Jensen RL. Elevated levels of measles antibodies in children with autism. Pediatr Neurol 2003;28:1-3.